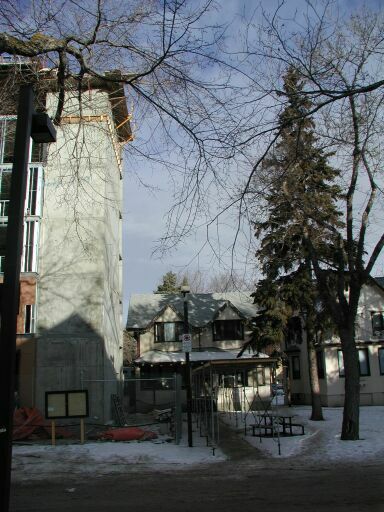 The structure of the Interational Students Residence towers 6 stories over a neighborhood of single family detached heritage homes. It is clearly out of place and out of scale. From the design and size, it is obvious that the character of the neighborhood did not enter into the decision making process when the building was designed. It is interesting to note the similarities between the new residence at the Faculte Saint-Jean and the one being built in North Garneau. 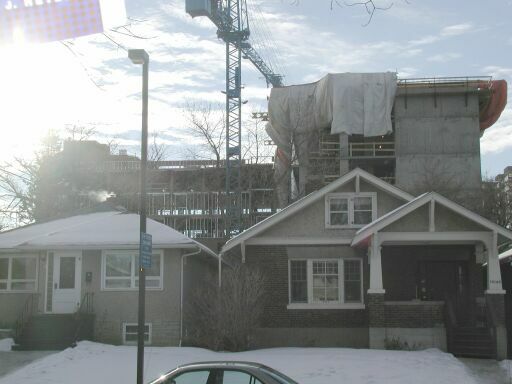 Reusing the design of this building is inappropriate for the North Garneau neighborhood and for the character of the East University Campus. 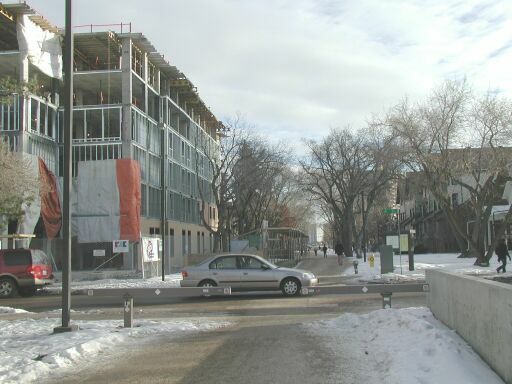 This is a side view of the building looking down 88th Avenue over 111 street which the University proposes to block to normal traffic and place an above ground parking lot spanning over it. Anyone who has driven out of Hub Mall parking lot knows how congested 111th street is even during quieter times during the day. All of this traffic will be forced to reroute down 110th street through the residential area when the University closes it. Traffic concerns including congestion and noise from trucks and snow removal equipment are very real issues the home owners of the community face. Have you ever had to listen to the endless beeping of snow removal trucks cleaning a parking lot? We can hear them loud and clear in Hub parking and they plan to move them even closer to the neighborhood. One thing to note, even though there are proposed 1500 beds to be housed in the new buildings, no allowance has been made for the parking of vehicles for the students or their visitors. The question has been asked, but not answered, as to why they do not consider an underground parkade where Hub parking currently sits instead of creating an incredible cluster of a traffic situation. The photo below illustrates just how out of step the building is with the character homes of the neighborhood, with more on the drawing board. There have been many good suggestions made by many of the residents would allow the University to realize its goals while preserving the community but no one is listening. We are told that 'nothing has been decided', but it is hard to believe that our concerns will be heard when there has been no one from the University even attending the Community Traffic committee meetings to deal with the ever worsening traffic situation in the area.